the ol’ mountain goat is still at it in 2007! 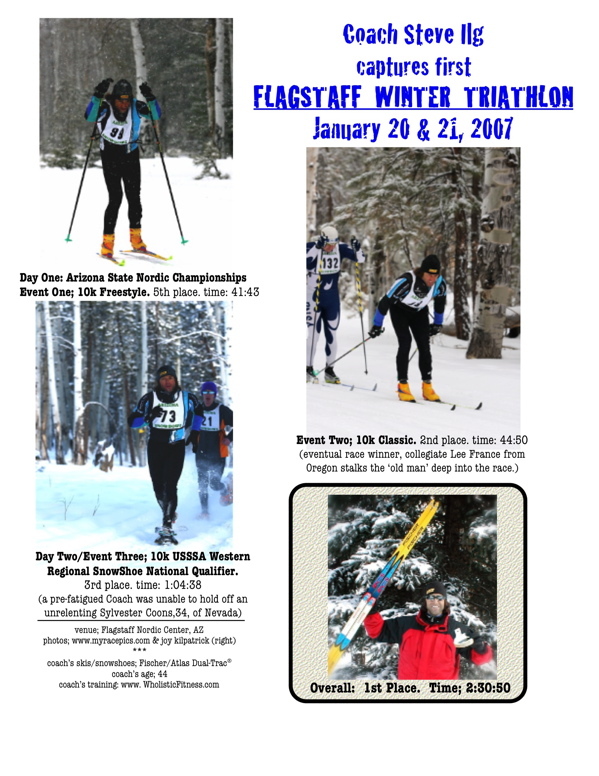 Steve “Coach” Ilg, 44, of Flagstaff, finished 5th, 2nd, and 3rd overall in a 10 kilometer Skate Ski Race, Classic Ski Race, and SnowShoe Race respectively, to win the First Annual “Flagstaff Winter Triathlon” at the Flagstaff Nordic Center this weekend. Ilg is a Senior Yoga Teacher with the International Yoga Alliance and teaches classes in “High Performance Yoga” in Flagstaff. A self-proclaimed, “simple mountain yogi,” Ilg is something of an outdoor athlete icon; he is a multiple outdoor and extreme sport performance champion, book author, and owner of www.WholisticFitness.com – the nation’s pioneering online fitness training service that emphasizes spiritual growth along with personal health and well being. 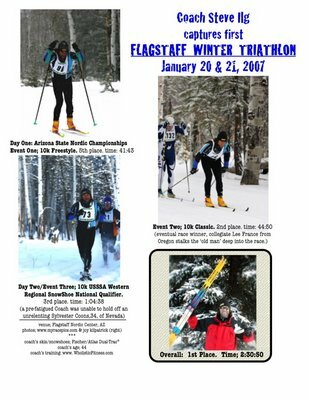 The Flagstaff Winter Triathlon is a unique two day, three discipline event which combines the “Arizona Cup” State Ski Championships with the United States Sport Snowshoe (USSSA) Western Regional Qualification Race to test Arizona’s most skilled winter endurance athlete.